This page is about a feature exclusive to Plus and Pro subscribers, or to players in a Game created by a subscriber. If you'd like to use this feature, consider upgrading your account. 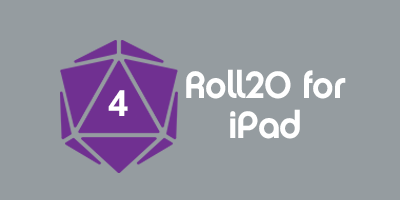 This feature is the Advanced Version of the Fog of War feature that is available to Plus and Pro Roll20 Subscribers. If you want to know more about the Fog of War Features that are available to all Roll20 users, please go here. The Advanced Fog of War feature clears fog away dynamically as a token moves across the Page. Each token's path is individually recorded, so each Player's view of the Tabletop will vary from person to person depending on which tokens they have control over. Similar to how a battle map is revealed in a real-time strategy computer game, the area that the token moves out of, remains revealed to the players in desaturated colors until they return. Monster and NPC tokens that are not in the player's token's current area of play will not be visible, even if they are present in the previously revealed areas of the Page. This allows you to reveal an ever expanding maze of a dungeon to the party, room by room, while they explore without having to manually clear the fog away for them. This feature can also be used in combination with Dynamic Lighting to block line of sight along dungeon walls and other obstructions. Fog of War takes up a layer that covers over the entire Page with 'fog'. To a player, areas covered in fog will appear pitch black on their browser. In order to see through to their tokens and the rest of the Page, the GM must trace out areas to reveal them to the Players. This experience can be cumbersome to manually reveal complex interior environments and you can't tailor the view for each individual player in the game. Advanced Fog of War assists with these two issues by having the tokens that emit light, or have a set view distance, clear fog dynamically as they're moved across the Page. The Fog divides itself up into a series of square cells that follow the grid set by your Page Settings (or the Scale you set for your Page when gridless). As a token moves across the playspace, the Advanced Fog of War calculates which cells the token has passed through and keeps them revealed on the Page. Tokens not in the Player's control that are on the Object and Tokens Layer that are in this revealed area, but NOT in the token's current sight range, are hidden from view as if they were on the GM Layer. The fog cells that a token has revealed is saved for each token on a Page, so each player potentially can have a unique view of the same Page they are all currently exploring. To enable Advanced Fog of War, go to the Page Settings dialog box from the Page Toolbar. Directly below the Fog of War checkbox is the section for the Advanced Fog of War feature settings. Enabled Checkbox: The Enabled checkbox will turn Advanced Fog of War on for the page when checked. Show Grid Checkbox: When this option is disabled, the grid lines will only be visible within the token's line of sight even if there are other areas of the Page that has been revealed to that token. Enabling Show Grid checkbox will make the grid visible over all revealed areas of the Page. If the Grid has been turned off on the Page, it will not generate a visible grid even if you have Show Grid enabled under Advanced Fog of War. 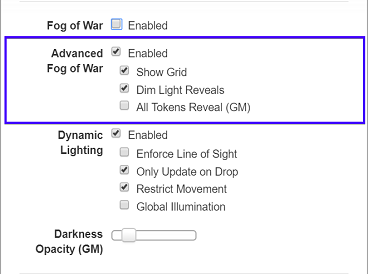 Dim Light Reveals Checkbox: By default, if a Token has Emit Lights settings established on the token's Advanced Token Settings, Advanced Fog of War will reveal an area that is only within "bright" light. It will ignore the larger radius that is cast in "Dim" light if available on the Token Settings. The Dim Light Reveals checkbox, once checked, forces the boundary of the fog reveal to include both bright and dim light cast by the Token. Note: If you have a vision distance set in the Advanced Fog of War section of a token's Advanced Token Settings, the Emits Light settings for that token are completely ignored regardless if you have Dim Light Reveals enabled or not on the Page Settings. Additionally, the Only Update on Drop option under the Dynamic Lighting section of the Page Settings also works for Advanced Fog of War. If enabled, the Advanced Fog of War won't be redrawn until after you pick up a token and place it back down on the tabletop. This can help with performance if the Page is very process-heavy. Now that Advanced Fog of War is enabled, you may need to adjust the Token Settings of the Tokens on the Page in order for them to reveal the advanced fog from the Tabletop. The Advanced Fog of War can utilize the Emits Light settings from the Dynamic Lighting section of the Advanced Token Settings dialog box. Underneath the Dynamic Lighting Token Settings is a field input for Advanced Fog of War called "View Distance". To access the Token Settings, double click on the desired token or click on the gear icon from the Token HUD UI when the token is currently selected. This will bring up the token's Token Settings dialog box. Click on the Advanced tab. From here, you can either input values under Emits Light or the View Distance value to control Advanced Fog of War's reveal. If you enter a value for Dim Light, this will not have an affect on the area revealed UNLESS you have it enabled in the Page Settings discussed earlier. Any value entered in the View Distance under the Advanced Fog of War section will supersede any value you have in Emits Light. If a light radius is not entered in the Dynamic Lighting portion of the Advanced Token Settings, the default value of two units, represented by a 2x2 grid cell square area, is used for the View Distance. The token must be controlled by a player in order for the token's reveal of the Fog to be visible to them. You can set this manually from the Token Settings (on the Basic Tab) or have it directed to the player who has edit permission of the character journal that token represents. 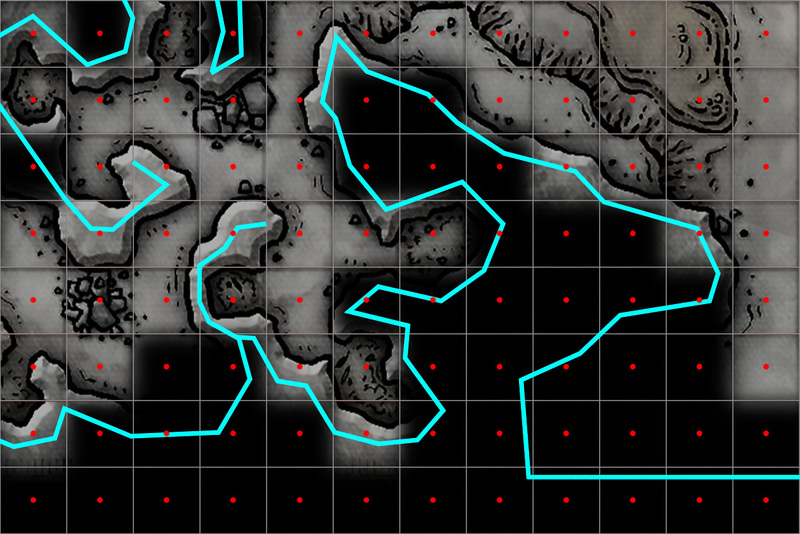 If you want to manually reveal or hide areas, you can use the same Fog of War subtools from the Tabletop Toolbox. The Reveal Areas, Polygon Reveal, Hide Areas, and Reset Fog tools are all available to you for Advanced Fog of War. If you choose to reset the fog or manually hide areas, the areas within the Token's set sight or vision range can not be hidden from view. If you want to keep an area hidden even from the Token's range of sight, you'll want to use both versions of Fog of War at the same time. As the GM, you will see each token's revealed path of the fog layer. At a glance, it may be difficult to know which player's tokens have uncovered which areas of the Advanced Fog of War. While you have a token selected, press the keyboard shortcut: Ctrl/⌘ + L. This will change the GM's current view of the tabletop to isolate the selected token's view of the fog layer. This is an example of the "staircase" visual effect when Advanced Fog of War is used alongside Dynamic Lighting that has walls that stray from the grid. In places you can see some advanced fog cells revealed past the Dynamic Lighting border. When using Advanced Fog of War alongside Dynamic Lighting, you may notice that some parts of your map may not be revealing itself as you might expect. This is due to Advanced Fog of War working on a grid system and having wall obstruction lines on the Dynamic Lighting layer drawn off the grid. Whether an advanced fog cell is revealed or not depends on where the dynamic lighting wall crosses through the grid cell. If a token is clear to reveal the center point of a cell, that entire cell of fog will be revealed. If the Dynamic Lighting obscures the central point of the cell, and the token can not see it, then the entire fog cell remains hidden. This may give the revealed area around your Dynamic Lighting walls a jagged, staircase appearance. You can see this happening around the rock walls of this cave area in the adjacent screenshot. Some fog cells are revealed past the Dynamic Lighting wall while others are still obscured. The center point of the grid cells have been drawn in to see where they are in relation to the dynamic lighting walls to give you a better idea of where these cell reveals are happening. If you find yourself in this situation, or dealing with a battle map that won't follow a grid, you can minimize this issues by decreasing the cell size of the Advanced Fog of War. With more cells to work with, the staircase visual effect will be smaller and less confusing for the Player. You can also utilize the Fog of War drawing tools to help clean up areas that aren't being revealed or hidden in the way that you want. Advanced Fog of War, bundled together with Fog of War and Dynamic Lighting, brings a whole new level of interactive map exploration. There are some caveats to be aware of when using Advanced Fog of War. There is no way to reset the view of a single token. If a single player has treated their token as a fog flashlight to reveal the entire page, the Reset Fog tool will reset all of your tokens' saved fog data for that Page. You can prevent unintended reveals in a couple of ways. You can enable Fog of War alongside Advanced Fog of War and manually cover up areas of the Page that have spoiler-potential. Another method is by controlling token movement via the Restrict Movement feature of Dynamic Lighting. This option will corral player tokens within the boundaries drawn on the Dynamic Lighting layer. Advanced Fog of War relies on a grid system, so the token's revealed path across a Page is represented by a series of grid cells cleared of fog. It can't reveal or hide partial areas of a grid cell. The cell is entirely visible or entirely hidden. This can run into issues if you have very narrow areas on your Dynamic Lighting or wall outlines that aren't aligned to a grid. You may get unintentional reveals of secret doors or corridors. We recommend enabling both fog of war systems to help prevent this from happening. Manually hide areas via the Fog of War fog layer (not Advanced Fog of War fog layer) that are not meant to be seen on the other side of a Dynamic Lighting wall. Like Dynamic Lighting, care needs to be taken so that you don't create too much lag for you and your players while using the Advanced Fog of War system. 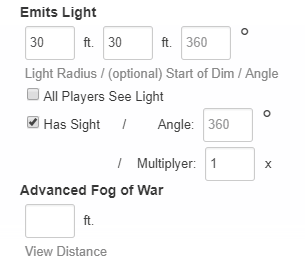 Each individual token that is emitting light or has an Advanced Fog of War vision set on it will have its view of the Page recorded to your game's data. If you have a lot of tokens on a Page set to interact with Advanced Fog of War, this may impact performance. You may want to minimize how many tokens are able to reveal Advanced Fog of War to only those that the Players are using, or only using one NPC token per monster group that reveals the terrain for them. One measure we've made to help avoid performance lag with Advanced Fog of War is implementing a cell cap to the grid being used for the Advanced Fog of War. If you go over the maximum cap of 50,000 cells, the Page Settings will supply a warning message that you are over the limit. This page was last modified on 12 February 2018, at 19:30. This page has been accessed 59,107 times.